Announcement Hello, my name is Alexis Trice and Welcome to the Doghouse! In my shop are current prints I have available, and one of a kind paintings. My main specialties are fun and creative custom pet portraits from photos, all I need is a photo to create a treasured portrait of your favorite pooch. They make excellent gifts for that special pet lover in your life. 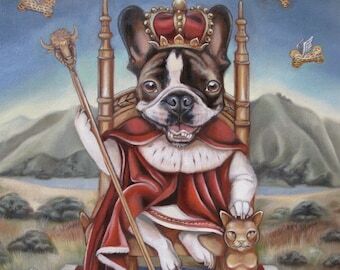 What better way to immortalize your pet than with an oil painting that will last a lifetime. More than just dog portraits, I will paint any pet you like in any scenario you can conjure up! Please visit my site www.welcometothedoghouse.net for more paintings and custom order info, and feel free to email me at welcometothedoghouse [!at] gmail.com! Hello, my name is Alexis Trice and Welcome to the Doghouse! In my shop are current prints I have available, and one of a kind paintings. Very sweet card! I would definitely order again! Really cute card. Very well made. Just a wonderful item! Hi, my name is Alexis Trice, thank you for visiting the Doghouse! I’m a native New Yorker, and graduated from The School of Visual Arts with a BFA in Illustration. Painting with oils has always been my passion, and animals have always been my subject of choice. I began my company WelcomeToTheDoghouse.net creating custom pet portraits after I discovered that my combined love for dogs (inspirational muses, Una and Thea) and art could be a rewarding career. I would love the opportunity to create an everlasting portrait of your beloved pet that will last a lifetime. I have been featured in online and print publications such as Dog Fancy Magazine, The NY Daily News, Pampered Puppy, Pedigree.com, City Rag, L Magazine, Fortune Magazine, AOL’s Paw Nation, Jagazine Magazine, Animal Planet’s Dogs 101, and Wag Magazine. I have had work exhibited at P.P.O.W Gallery, Clover’s Gallery, Mighty Tanaka Gallery, Niagara Gallery, 323 Gallery and currently has pieces on an international tour with Fuse Gallery. Exchanges are allowed if print arrives damaged during shipment, for base cost. Payments are expected within 24 hrs of purchase, thank you. All prints are shipped via USPS Priority with tracking and insurance. Delivery confirmation and expedited shipping are available upon request, please send me a convo to set it up. For international orders, extra shipping charges may apply and I will send you an invoice with the exact difference after shipment. Orders are usually shipped within 24-36 hrs of payment.